Probably not the Galaxy ad Samsung was hoping for! 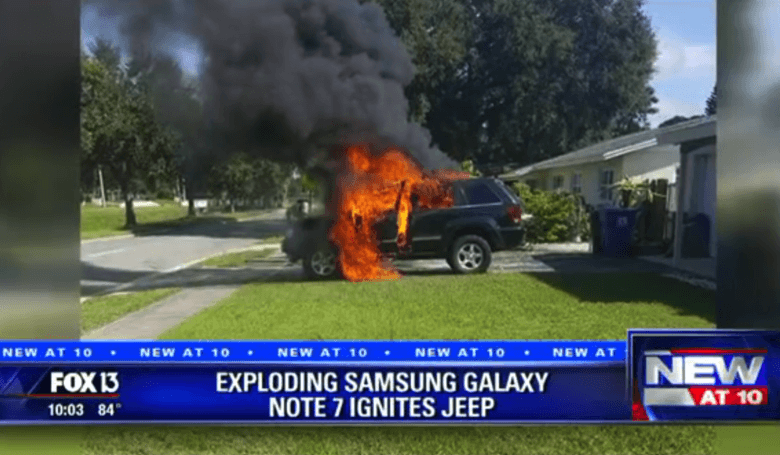 An exploding Samsung Galaxy Note 7 smartphone has reportedly totaled the Jeep Grand Cherokee of a family in St. Petersburg, just days after Samsung issued a worldwide recall for its hottest new smartphone. Owner Nathan Dornacher said that he and his wife went to a yard sale over Labor Day weekend. While unloading a desk they’d bought for their daughter, Nathan left his new Note 7 to charge in his vehicle. When they asked their 8-year-old daughter to get back into the vehicle so the family could go and run some errands, the family dog alerted Mr. Dornacher to the fact something was wrong. When he looked, he saw that the Jeep Grand Cherokee was on fire. In a statement to FOX 13 News, a Samsung representative confirmed that it is aware of the incident and is doing everything it can for Mr. Dornacher. Initial feedback to the Note 7 was strong when it was recently launched. However it didn’t take long for reports that some Galaxy Note 7 handsets were randomly exploding while on charge. Samsung claims just 24 in every 1 million units is at risk of exploding, but issued a total global recall all the same. With yesterday’s announcement of the iPhone 7 and 7 Plus, the recall couldn’t have come at a worse time for Samsung — although stories like this one show why it was absolutely the only move Samsung could have made. Total costs for Samsung for the recall are likely to cost in the vicinity of $1 billion. Fortunately no-one has yet been injured.